I think everyone would agree that macaroni and cheese is the ultimate comfort food and there is nothing as satisfying when properly made. Unfortunately though, all that cheese comes with a high price, and many recipes are very high in fat grams and calories. 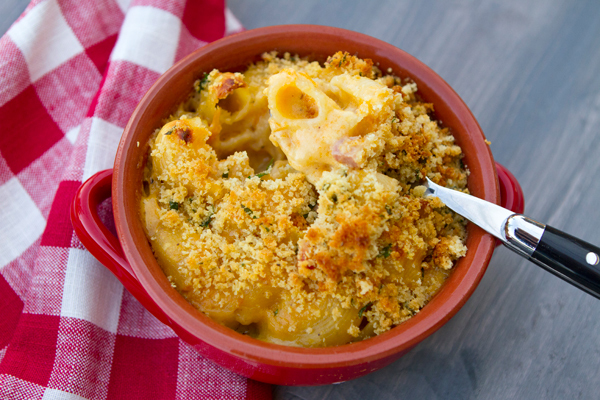 I was “rebuilding” a recipe for mac and cheese, cutting a good deal of calories from the original recipe but wanting to ensure that it still was creamy and delicious when inspiration hit and I decided to add pumpkin puree to my ingredient list. 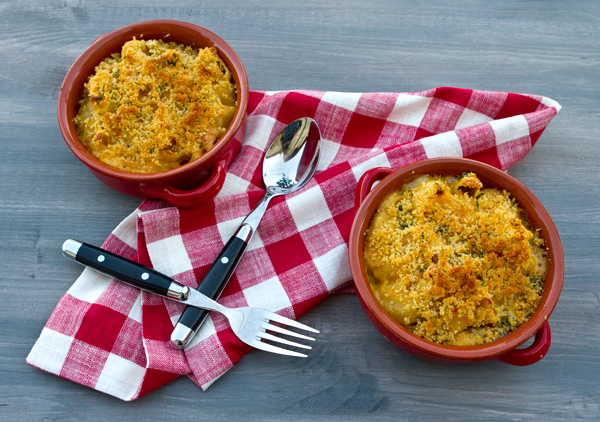 I also included some Italian turkey sausage along with the pumpkin, and the final result was this baked pasta dish, a satisfying, delicious, and healthier version of mac and cheese. The pumpkin adds a suble sweetness that pairs well with the sausage and the dish is both hearty and satisfying. The use of sharp Cheddar allows you to reduce the overall amount used, and although I also used Fontina and a cream cheese, you can use any semi-soft melting cheese you prefer. Pumpkin is loaded with beta-carotene. Using sharp Cheddar allows the overall amount of cheese used to be cut without losing flavor thereby cutting calories and fat grams. Turkey sausage adds flavor but is much leaner than regular pork sausage. Whole wheat breadcrumbs replace regular ones adding nutritional value. A creamy and satisfying dish that includes the surprise ingredient of pumpkin. In a heavy saucepan, heat the oil, and cook the sausage meat over medium heat until it is lightly browned, about 5 to 6 minutes. Add the flour and stir until mixed. Add the milk, whisking into the sausage and flour mixture until blended. Heat the milk until steaming, then add the pumpkin, and cheeses, stirring well. Continue to cook until the cheese has melted and the sauce is creamy. Taste, and season with salt and pepper, then keep warm. Cook the pasta until it is very "al dente" then drain and return to the pot. Add the cheese mixture to the pasta and stir to combine. Pour the pasta mixture into one large, lightly greased casserole dish, or individual ones as shown. In a small bowl, mix together the topping ingredients with your fingertips, working the oil into the breadcrumbs. Sprinkle the top of the casserole with the crumbs, then bake until golden brown and bubbly, about 30 minutes.